Eastern Division and Thunderbolt Patrol/Mt Greylock Ski Club are planning an MTR Enhancement Seminar which is already registered with National. The site is Mt. Greylock Ski Club, Williamstown MA. Instructors include IOR Eric Zaharee, IT Craig Garland, David Childs, and Rich Adamczyk. Course cost is $25. The dates are Saturday and Sunday, September 12 and 13. Due to an early start Saturday, patrollers should arrive Friday and spend the night. For addition details, contact David Childs 413-464-4056 dchilds@epri.com or thunderboltpatrol@gmail.com. The Ragnar Trail Relay is an overnight running and camping adventure. Teams will run relay style for a total of 120 miles in 22 hours. The dates are Friday and Saturday, June 26 and 27. Find more information here. Eastern Division Avalanche, Mountain Travel & Rescue, and Nordic instructors will convene at Northfield Mountain for a weekend of seminars and skills refreshers, the sixth time here in nine years. The participants will camp at Barton Cove over the weekend. The dates are Saturday & Sunday, September 19 & 20. The 2011 event was featured in the Winter 2012 issue of Ski Patrol magazine. Keep up to date on the weekend’s program by visiting the AMN15 website. Telluride Mountainfilm On Tour returns to Hampshire College in Amherst on Saturday, February 28, 2015! Mountainfilm focusses on culture, environment, and extreme adventure. The best of short, prize-winning films tour the country. Those screened in Amherst will be selected from this list. Read more here. The Northfield Mountain Nordic Ski Patrol was recognized by the National Ski Patrol in January, 1975, and now enters its fifth decade of service to skiers. Questions? Contact Bob at 413-442-0444. If you have your own rescue toboggan, please bring it with you. Visit these NSP web sites for information about courses and other events. The Northfield Mountain Facebook page download with photos, snow conditions, and suggested wax. The patrol’s annual skills refresher will be held Saturday, December 6th. Activities will include the CPR, AED, and O2 refreshers; procedural review; and low-angle rescue. Registration begins at 8:00 AM. The Northfield Mountain Nordic Ski Patrol website (www.nmnsp.org) first went online in November, 2003, eleven years ago. Since then, we’ve announced upcoming patrol activities and reported related events outside the patrol. If you’re nostalgic, take a look at the first month of postings in fall 2003. You’ll find that the format is a bit different, but the page is still familiar. Pretty Faces, a documentary featuring female extreme snowsports athletes, is coming to this area. To view the trailer, click the above image or watch it in full-screen format. Catch the film at Hadley Farms Meeting House on Thursday, November 13, at 7:00 PM. The Fall 2014 issue of Ski Patrol Magazine announces Snow Guardians, a 52-minute documentary about the work of ski patrollers in Montana. Avalanche safety and Search & Rescue operations heighten the drama of this production. Click the above image to play the 2-minute trailer or watch it in full-screen format. You can buy the video at the Snow Guardians Store. Completion of the annual OEC refresher is necessary to continue as an NSP Patroller. Here are three ways to find a session with another patrol. 2. Contact patrols in the regions: Western Massachusetts, Eastern Massachusetts & Rhode Island, Southern Vermont, New Hampshire, Connecticut. 3. Go to the NSP Course Schedule, select Eastern Division and then OEC Refresher Cycle A (2014). Ignore any other courses listed. You will need to complete the OEC workbook exercises before the Fall OEC Refresher. You can find it here. 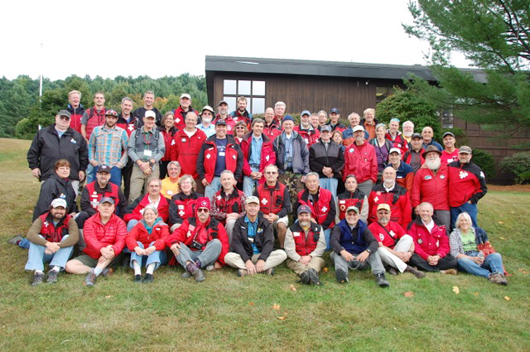 Eastern Division Director John Shipman was on hand to welcome 63 Avalanche, Mountain Travel & Rescue, and Nordic (AMN) instructors to Northfield Mountain for a weekend of enhancement seminars and skills refreshers. Participants travelled from 12 states as far away as Ohio and Virginia. The program included an 8-hour low-angle rescue class. Most of the instructors camped out for the weekend at Barton Cove. Read more about the event at the AMN14 website.